Turn kitchen waste into a garden asset with this Composter from Forest. The stylish slatted design will look great at the bottom of any garden, and with a 400ltr capacity you will never be short on compost. The softwood used to manufacture this composter has been pressure treated to protect it against rot and fungal decay for 15 years. 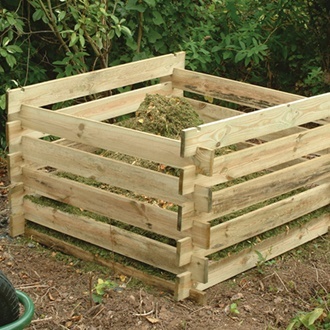 - This simple slot together composter is quick and easy to build and is delivered to you flat packed with easy to follow step-by-step instructions and all the fixings you need for a simple build.